Slice your baguette and drizzle with olive oil, rub with fresh cloves of garlic and sprinkle with fresh thyme and sea salt. Bake in a moderate oven until crisp and golden and allow to cool. Plunge asparagus stems into boiling water for no more than one minute. Refresh under very cold water, pat dry and set aside. Take the king scallops and trim leaving just the white meat (you can leave the coral on if you like). Toss the scallops in a bowl with a little extra virgin olive oil, a sprinkle of fresh thyme, black pepper, grated zest of lemon and a crushed clove of garlic. Heat a heavy pan until very hot. Place the scallops flat on the pan and allow to colour evenly on both sides (this will take only a minute). The scallops should be cooked but still a little opaque in the centre. When cooked set aside and pan fry the asparagus until well coloured all over. 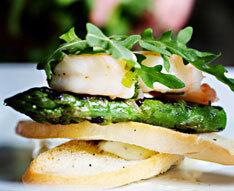 Assemble the warm asparagus on the bruschetta and top with scallops and garnish with rocket. Baste with a little lemon juice mixed with extra virgin oil and fresh chopped thyme and serve.